Interior design is a luxury that we all wish we could afford for our own homes, and the airline industry is no different. Interior design was surely considered a luxury and never a necessary expenditure; as long as passengers were safe and meeting their connections…what more did a passenger need? Well, demand for upgrades is rampant and passengers are asking to fly in style…so, let’s bid farewell to those dated cabins and embrace some great concepts. When you’re designing for a confined space like an airplane cabin, you need to get a little creative. Space is limited, so it becomes a challenge to meet an airliner’s requirements (adding seats, creating more room in overhead compartments, lighter materials, etc.) while keeping in mind the safety and comfort of passengers. But industrial designers are a clever bunch, always finding new solutions to seemingly impossible challenges. And many of the best are recognized each year at the Crystal Cabin Awards, held at the Aircraft Interiors Expo in Hamburg, Germany. While many concepts will never make it off the drawing board, here are some of the latest ideas we would love to see on a future flight. Wicked smart beverage cart design. 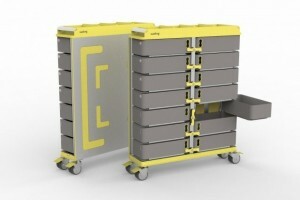 Spotted by Skift.com, this service cart concept from the Barcelona School of Design and Engineering’s Elisava Center falls into the “why didn’t they think of this sooner?” category. Because it’s thinner, it allows passengers to slip by (they always love to hit the lavatories when the drink carts are out). Smartly designed drawers allow for easy access, while rounded corners mean less painful bumps to the elbows. The Solar Eclipse is a typical tray table with a place to hold your tablet or smartphone. Seems simple, but the judges at the 2015 Crystal Cabin Awards thought it was brilliant enough to make it a finalist. It frees your hands and arms from having to prop up your device, yet it doesn’t take up any room on the tray table. Some brilliant seat advancements are coming. probably guessed, charges your portable devices using sun power. With so many passengers carrying multiple devices, the Solar Eclipse is an affordable way for airlines to provide in-seat power to small devices, without installing standard power outlets. With nearly every domestic airline charging a fee to check a bag, more passengers are carrying them on instead. 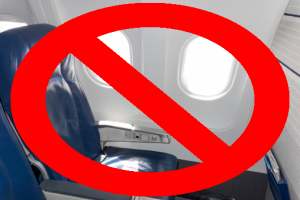 When a plane is full, however, those overhead compartments become extremely scarce and valuable. Boeing has figured out a way to increase capacity with the Space Bins. Each compartment holds six standard sized bags – two more than previous designs. When opened, they are lower in height, making it easier to lift bags into them. Boeing says the Space Bins will add 50-percent more luggage space, while decreasing the amount of time it takes for passengers to look for open space – crucial if you want your plane to push back on time. Expect to see them in the upcoming 737 MAX. In the regional jet market, Brazilian manufacturer Embraer has created the concept for its next generation of jets. Regional jets typically have small cabin interiors, but the E2 cabin looks spacious. Embraer says overhead bins are 40-percent larger, which will please frequent fliers who travel on these small jets often. For premium passengers, the E2 cabin uses a staggered seat concept to create the sense of personal space. For travelers with young kids, having to carry a child seat adds to the burden. The is a seat concept that has an integrated child seat for both infants and small kids. Developed by Lufthansa Technik, the seat can convert into positions to accommodate very young travelers, while keeping them safe. It eliminates the need for parents to bring cumbersome child seats onboard, and helps speed up the boarding process. Sometimes, the hassles of flying make you want to escape from it all, and that’s sort of the idea. Designed by Alexandra Moceri, a product design student at the College for Creative Studies in Michigan who interned with B/E Aerospace, the Escape is a visor that doubles as an in-flight entertainment display. To activate the headgear, a user simply pulls the visor in front of their eyes and uses touch pads on the armrests as controls. A finalist for this year’s Crystal Cabin Awards, check out Moceri’s other ideas at the College for Creative Studies. Another university concept, the Enable uses the surface of a tray table as an interactive display. Developed by students at in the Netherlands, Enable provides customers with customized info, and functions as an in-flight entertainment display. Place a physical book on it and it will tell you what it’s about, or it’ll pull up options when you put down headphones. Oh, and it doubles as a tray for your food. Of course, it’s a bit Hollywood in concept, but not entirely impossible in the future. A Crystal Cabin Award winner in 2013, Thales’ Eye Tracking and Hand Gesture Control uses those body parts to navigate a seat-back display, removing the need to use actual remote controls. 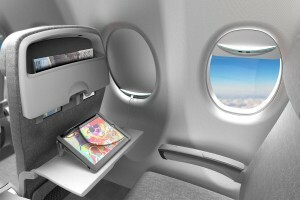 The system is designed for premium cabin passengers that are treated to larger screens, but usually sit far from it (economy passengers sit close enough they can tap on a touchscreen). Thales says the system makes it more user-friendly and natural to control.